Planning dispute with neighbour over whether his planned building work would reduce her light. "a multitude of tendrils shimmer and writhe in tiny capillary movements [...] a visual ecology built from bacterial marks and history’s dust"
His The End and Fin prints are very good. 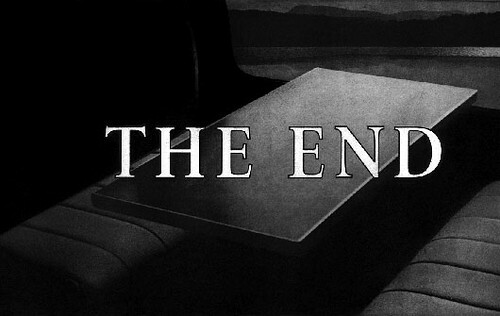 Richard Roberts has some very nice 'Fin' and 'The End' prints, which might be taken from films. Peter Rapp is showing an artist's book of extraordinary and beautiful violence, sometimes self-inflicted. And Nick Morley has some funny bearded men. I want their work, and to be able to make work like it. Nice studio; they do courses too. Pretty good group show in the other half of the same building: Laura Oldfield Ford's pencil drawing is like a precursor to Paul Noble's Nobson Newton: a pencilled society on the verge of catastrophic decay. Peter Peri had one of his black paintings (I still prefer the excellent drawings). Mark Harris's excellent inky drawings on printed images are full of schoolboy plenitude - repeated shapes and spidery constructions reminiscent of Superstudio's proposals. "Books can learn from magazines' mistakes; surviving the internet doesn't mean paper replicating an online experience, or vice versa, and people will happily pay a lot more money for a slightly better product (see Monocle's success)." "the older me has more time for Calvino the fabulist (Our Ancestors), Calvino the short-story writer (Adam, One Afternoon) or Calvino the essayist (Six Memos for the Next Millennium) than for Calvino the Escher"
"novelists dream of the close [Joycean, insomniac] reader: perhaps every reader tries to be one. But no reader, however perfect, reads a text as closely as the novelist would want [...] "A good reader," said Nabokov, "a major reader, [...] is a rereader"
2006-7 platform for art project along the Piccadilly line, a thin city. The website is conversely a garden of forking paths. "Lucy Harrison is inviting members of the public and staff from the station to contribute to a newspaper which will document life and the changes in Stratford from the perspective of the people who live and work there"
"a collection of evocative phrases taken from the back of found photographs. Printed in New Johnston font"
Their open studio this weekend is good, and a show at Space in the same building. Adam Thirlwell's Begin again is good on the difficulty of the magpie reader, collecting books up, starting many, darting between them. A novel is always the same, but we live lives too distracted to comprehend it. Every composition is always too long to be read accurately. Sadly, I began to think about the haphazard oddness of my reading, of my book buying. The recent record, as I considered it, seemed crazy in its formlessness. [...] Perhaps all novelists dream of the close reader: perhaps every reader tries to be one. But no reader, however perfect, reads a text as closely as the novelist would want, with the adequate amount of concentration. And even if a reader has concentrated, so much is lost, because memory is so defective. He says that the only hope, against the effacing tides of memory and busyness, is re-reading. "A good reader," said Nabokov [a quote from Lectures on Literature, 1980], "a major reader, an active and creative reader is a rereader." The only hope is continuous repetition. How else, after all, can anyone see the form? And if you can't see a work's form, then it isn't really reading at all. But who, therefore, has the time to really read? I measured, sadly, the constant overtaking of books actually read by the crescendo of books I had bought or borrowed or been given. The books I had abandoned. And I began to think about all the novelistic techniques - of recurring characters, counterpoint, minor characters, thematic echoes - which depend on a work's grand length and the reader's prolonged concentration. All these small techniques seemed clues to a larger disquiet, a repressed truth. Every novel - this is my worry - is invisible. Recall Joyce who described Finnegans Wake as the "the ideal book for the ideal insomniac" (rather than demanding an ideal insomniac for his books). Tom McCarthy's Remainder is a clever novel about re-enactment and repetition. However, upon re-reading it dutifully, the narrator now seems absurdly narcissistic and the situation beyond plausibility. And strangely, the book itself stoutly resists the reader's re-enactment of the reading performance, and by the time I'd slogged to the end I was no longer sure if that reinforced or undermined McCarthy's point. Incidentally, I use the word reader very loosely. Curiously enough, one cannot read a book: one can only reread it. A good reader, a major reader, an active and creative reader is a rereader. … When we read a book for the first time the very process of laboriously moving our eyes from left to right, line after line, page after page, this complicated physical work upon the book, the very process of learning in terms of space and time what the book is about, this stands between us and artistic appreciation. More on this to come. If I ever finish. adaptive path » blog » Sebastian Heycke » Chatting with Stamen Design. Editorialising/perception as the challenge in exposing data. "He doesn’t want to make it look bad but we don’t have any problem showing everything from the last month or all of the murders in one month"
Good stuff on input field interaction design. It is indeed a matter for parlt rather than the judiciary. "Any new legislation will have to comply with the right to a fair trial guaranteed by the Human Rights Act. Finding a model which achieves this will not be easy"
NBPA loud in its commentary (without Ghaffur's support)? Unlikely to be good for the Olympics security programme. ROI for North Wales Police's 2007 case study: a 58min increased time out of station and reduced "dead" time per shift for uniformed constable and PCSOs; projected 1.475m saving for 2007-9. "Imagine imposing a tax on every corporation in the developed world, collecting $100 per white-collar worker per year, and then directing one third of the proceeds to curing AIDS and malaria"
ACPO/HO admit u-turn on single agency approach (Jul07): "risks and complexities of such an approach to be of such magnitude that we are looking at the viability of two complementary agencies at the border; concerned with control and security respectively"
Police "federation had taken legal advice that it would be fighting a "losing battle" if it tried to appeal against the High Court decision", and has presumably withdrawn significant goodwill with it. This is what Flanagan addresses. "Under Ripa, councils can conduct surveillance if they suspect criminal activity [...] But the interpretation of what is criminal activity has led to some debate"
Productivity: 8 x 60hr week = 8 x 40hr week. "In both the short- and long-term, reducing sleep hours as little as one hour nightly can result in a severe decrease in cognitive ability, sometimes without workers perceiving the decrease"
"Merger mania also rests on what you might call the fallacy of ownership—the assumption that you have to own a company to make money from its properties"
From Guardian's review of Brown's first year as PM. "increased the counter-terrorism budget, with money for MI5, MI6, GCHQ, and the Metropolitan police due to increase from £1bn to £3.5bn a year by 2011" From Guardian's review of Brown's first year as PM. Scotty Wakefield: Scrum and Prince2: working together? "PRojects IN Controlled Environments [...] If however there is a high level of complexity or an uncontrollable environment then you need a project management strategy that can cope with the complexity" Good agile metaphor: mtn hiking from peak to peak. An inductive (deductive?) sublimation: the absence of something proving its previous presence. NAO says there's still no costed security plan "or for making sure that wider security requirements have been fully reflected in the planning and delivery of other activities within the London 2012 programme." "Simon Shibli, a researcher at Sheffield Hallam University [...] figures the "home field' advantage will be worth about seven gold medals in sold out arenas packed with cheering Chinese"
"best performing police forces should be given "foundation" status" says ACPO. "set their own priorities, guided by local people. But [...] counter- terrorism must remain under central control to prevent a "free-for-all"." "Titans were [...] enormous in size and strength, typical of lawlessness and the power of force. Whoever thought it was appropriate to name 21st-century prisons after them must have been out of his or her mind." "Blom-Cooper argues for a reparative approach and that custody should be used only to protect the public and not to inflict punishment for its own sake"
Nice graphic summaries of current UK economic pain. Meat is your friend. Trust Meat. "To buy a magazine costs 20¢ per page, plus shipping. For example, a 20-page magazine would be four bucks plus shipping [...] You set your issue price and all proceeds above the base price go to you." Champions by another name (and "reverse mentors" a revealing term): "didn't [fully grok new tools] but acknowledged them as transformative. So, he sought out a "couple Gen-Y folks in his group to be reverse mentors."" "Eats your del.icio.us tags and spits out a tasty timeline." A West coast of Scotland treat. Could clearly be improved by battering the cardboard box and deep frying the lot (to make a vernacular Rôti Sans Pareil), says Bert. Licence/practice/advice = noun. License/practise/advise = verb. Good grammar/spelling tips. Guardian's arts critics review sport. Had hoped for a bit more from Jonathan Jones on football - the man is brilliant. Guardian's sports writers review the arts. You'd have to say 1-0 to the sports writers. The arts journos didn't track back, needed a rousing half-time talk, they didn't want it enough, etc etc. Oct 2006:"bid document for the games included £220m for security, but the figure, which was drawn up before last year's bombings in London, is expected to rise steeply. So far the Met has received £4.6m to help prepare for the games." David Ross's 18 june 08 report and Boris's response. Future use and budget the biggest concern. Security programme lagging. Cue grumpy officers. AC Ghaffur: "It will be wrong for me to say, given the skills and resourcing issues, officers will be able to go on leave in the summer of 2012, as we do in most summers." "biggest security challenge is need for extra 7,000 security personnel. "Currently, there’s an estimated 150,000 SIA-licensed security operatives in the UK [most already employed]". Bonus comments on architecture for security. Brown "will back online maps comparing areas' crime and police performance and local "community champions""
Humiliation as a motivational force. See also the harrassing tactics being trialled by Essex. Further 10 forces to trial the Lantern mobile fingerprinter (hooks to Ident1) alongside the 10 already trialling. "In trials, British Transport Police saved an average of 30 minutes per case, as did 90 per cent of officers involved in the pilot"
Qinetiq and NPIA serve each other writs for breach after NPIA cancels web portal project for public to report incidents online. Both sides will feel utterly in the right; nasty PM/process may be to blame?. "if the boss still wants everything emailed [...] Enterprise 2.0 [yuck!] becomes above the flow rather than in it, and so likely increases interruptions rather than decreasing them"
Presumably the behaviour is: I am very tired and have so much work still to do; I will take these home and read them there; it will be fine - I'll be careful. Canon Dial 35. Feels like 2003 not 1963. Sinclair gets his grump on about the loss of authenticity/history/realism/community in East London with the Olympics 2012 development. "Paul Lewis observes Operation Leopard, an 'in your face' surveillance programme being pioneered by Essex police in a bid to cut antisocial behaviour by young people"